The Government of Sweden signed an agreement to purchase Raytheon's Patriot Air and Missile Defence System from the U.S. Army. The agreement, formally referred to as a Letter of Offer and Acceptance, paves the way for Sweden's Patriot Force to rapidly reach Initial Operational Capability. Raytheon's Global Patriot Solutions provides a Missile Defence Architecture that is continuously upgraded to keep ahead of evolving threats. 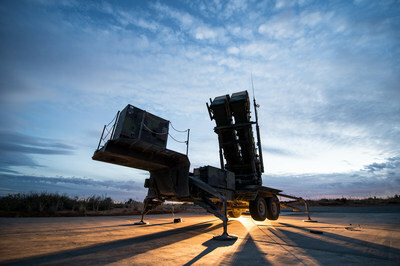 "Sweden and 15 other countries trust our Patriot System to defend its citizens, military and sovereignty because Patriot has a proven track record of defeating ballistic missiles and a host of other aerial threats," said Wes Kremer, President of Raytheon Integrated Defense Systems. "Patriot in Sweden will enhance Northern European Security and further strengthen the Trans-Atlantic Partnership by providing a common approach to Integrated Air and Missile Defence." Patriot is the backbone of Europe's Defence against Ballistic and Cruise Missiles, advanced aircraft and drones. European Nations with Patriot include: Germany, Greece, The Netherlands, and Spain currently have Patriot. Within the past 12 months Romania and Poland signed Letters of Acceptance for Patriot, becoming the 5th and 6th European Nations to procure Raytheon's Patriot System. The 16 Patriot Nations are: United States of America, The Netherlands, Germany, Japan, Israel, Kingdom of Saudi Arabia, Kuwait, Taiwan, Greece, Spain, Republic of Korea, United Arab Emirates, Qatar, Romania, Poland, and Sweden. The Government of Poland had earlier signed an agreement to purchase Raytheon's combat proven Patriot from the U.S. Army. The agreement, formally referred to as a Letter of Offer and Acceptance, paved the way for Poland’s Patriot Force to rapidly reach Initial Operational Capability, and sets the stage for the U.S. Government to begin contract negotiations with Raytheon and its Industry Partners. Patriot in Poland: Prior to signing the LOA, Poland agreed to an industrial-participation proposal offered by Raytheon and its Industry Partners. To facilitate Poland’s self-sufficiency, which is required by Polish law, Raytheon will transfer technology to the maximum extent permitted by U.S. law and regulations. This LOA is for Phase I of “WISLA,” Poland’s two-phase medium-range Integrated Air and Missile Defence procurement. Under Phase II, Poland has stated it intends to acquire additional Patriot Fire Units, Gallium-Nitride-based 360-degree Active Electronically Scanning Array Radar, and SkyCeptor, a low-cost Interceptor Missile.